There was a great crowd for the Hustings on Friday evening, and we had a wide range of questions. I know some people weren’t able to get there, so I wanted to post my introduction and closing remarks from the evening. Thanks to the organisers, the other candidates and the audience. I’d like to start by telling you a little about myself. I’ve lived in the area since 1999 and my three children have grown up here. I originally trained as an engineer and spent 20 years working at Orange, mostly in IT development and management, and for the last few years have specialised in mobile phone apps and helping app developers make better apps. I became involved in local politics when the council was threatening to put a local farmer out of business and to compulsory purchase Warren Farm to become a ‘coastal park’. Normally such a park would be provided by the landowners developing their land for housing. With massive local support we won that campaign and saved Warren farm. 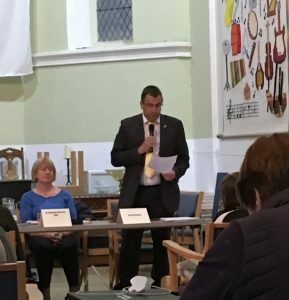 I was elected a Town Councillor in 2015, and continue to get things done, such as helping the residents in Secmaton lane where South West Water was allowing the homes to flood with sewage, and having Network Rail fix the tidal flooding at Eastdon that had been a problem for years. But there are many things that the town needs Devon County Council to fix. I want to stress that council staff do a great job, but they are let down by choice made by management – the councillors, our representatives. Dawlish gets a bad deal on so many things that DCC does, the cycle paths are in a mess, the roads are in a state, we are left waiting for the vital new Link road from Sainsbury’s to Gatehouse. And then we have the schools teaching budget cuts, closing all the children’s homes, closing care homes and leaving them empty – like Daw Vale here in Dawlish. There are too many examples of Dawlish getting the wrong solution from DCC. I’m sure we will hear many financial details tonight and that ‘there isn’t any money’, but DCC continues to waste our council tax, spending £2 million on PR and advertising, £400k on hiring external meeting rooms and even wasting £20k each year to pay a financial consultant to advise on future interest rates. It’s all about how DCC chooses to spend your money. On Thursday May 4th you can choose to make a change, you can make a positive choice for Dawlish. Dawlish has been getting a bad deal on so many things that Devon County Council should be doing for us. Our representative clearly hasn’t been looking out for the area. If you choose to elect me, I will do much more than simply hand out chunks of the £10,000 fund that each councillor has to spend on local issues. I will focus on fixing the cycle paths to be safer for everyone and getting the roads fixed. I will push to get the schools budget cuts reversed (that’s a Devon-wide Lib Dem promise). I will fight to get the essential link road in place before construction traffic further damages our roads and endangers our school children. I will oppose wasteful spending such as the £24k pay rise for the CEO of the Local Enterprise Partnership (LEP) that DCC helps fund (and which may bring even more housing to Dawlish) and instead focus on aspects including getting the care system working better. Additionally I will push South West Water to include the major upgrade that Dawlish needs in their next five-year plan. And push Stagecoach to get the No.2 bus frequency restored, and to consider express services along with bus services for Dawlish Warren. On Thursday May 4th when you choose, please make a positive choice for Dawlish.